Evan’s little guy has a birthday coming up and he needs his first set of wheels. Evan’s son will cultivate his need for speed the way many of us did when we were young, with a ride-on vehicle. What car should he buy? As a gear-head parent, we have the responsibility to pass on our sickness passion to our kids. Usually, it starts with die-cast cars like Matchbox and Hot Wheels, and maybe transition into a foot propelled Cozy Coupe. But in order to get a real feel about what it’s like to drive, you need some kind of motor driving those wheels and the opportunity to learn how to stop, go, and turn. I live in New York City and I’m looking to get a ride on toy for my son’s upcoming first birthday or for Christmas. I don’t want anything modeled after an electric car and would prefer something cool. My wife is into muscle cars and loves a 69’ Malibu SS, while I am a Porsche 911 GT3 kinda guy. 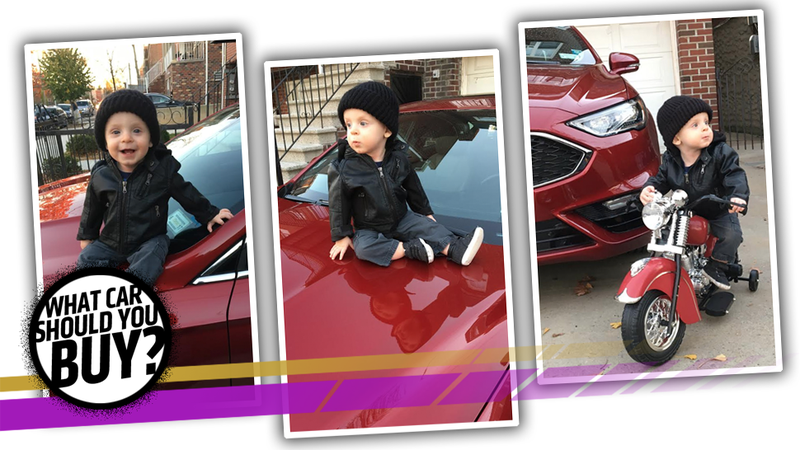 We want to share our passion about cars and hopefully get him excited about automobiles as well. Our son likes exploring, chasing our dog, and cruising around the park. Expert #1: Tom McParland - Is a dorky dad who knows what kids like. Okay Evan, first some bad news. Because your son is just turning one, you may want to wait another year or so for this purchase. The reason being is that most of the Power Wheels-type cars that are appropriate for one-year-olds are small, therefore they tend to outgrow them quickly. So if you buy one now, be ready to purchase another one in a few years. I know you’re tempted to live out your exotic car purchase fantasies through your child, and you’ll want to get something like this miniature Audi R8, which is one of the few cars that doesn’t look awkward when scaled down. The problem with these is the appropriate age range is for two to four years old, and by the time they are three, they won’t be able to fit in it anymore. I suggest you start with a simple ride on toy that will help him learn balance and has some cool do-dads that will keep him occupied. I like this vintage looking fire truck with removable ladders, and a real working bell that will drive you insane after the 100th ring. But all kids love fire trucks and this is a nice toy that won’t look like a junky piece of plastic in your living room. Once junior is ready for the full on Power Wheels experience, think very carefully how and where the car will be used. I see you are in NYC so I assume this will be driven mostly on sidewalks and driveways if that is the case go nuts and get him a mini-sports car. However, if plan on having your son drive this thing in the yard, I strongly recommend getting an ATV style vehicle, the reason being is that unlike the sports cars the big tires and higher ride height means they won’t get stuck in grass or dirt and they can power over branches. Also, no doors will give them room to grow. We got our son something like this Yamaha and he would spend hours outside in our back yard crashing into trees and exploring around. While you may want to show off your little one’s mini-McLaren, keep in mind the goal is to have them learn to operate a motorized machine and have fun outdoors. As a fellow New York dad I’ve definitely considered this already and I’m pleased to let you know there are tons of good options. If your kid likes fire trucks you can get them into this tough-looking Ram HD with a working firehose. Honestly, I’d have gone blind from happiness if someone had gifted this to me as a child. Toys-R-Us is actually having a sale right now on a 991 Porsche 911 GT3 and it’s worth it just for the pizza pan-sized faux brakes. Maybe this is a fight with your wife you’re ok with winning (for non-married people, winning an argument is often worse than losing one). Why not split the difference? This $349.99 6V Shelby Cobra offers a classic look along with f’real-I-love-cars street cred. On the plus side, it’s a single-seater and therefore probably easier to carry and store since I’m guessing you’re not living in a single-family dwelling with a big garage. On the downside, it’s only 6V and the price bump you’re paying is probably for the Shelby name and not quality. Just think of it as preparing your child for the real world where nostalgia trumps logic. But a tiny Cobra! For your kid! What could be a better tool of persuasion in your quest to indoctrinate your child? First, I want to set some expectations: your kid is turning one, which is, by most standards, quite young. Technically, it’s the lowest whole-integer age you can be. I’m not totally sure they’ll be old enough to really appreciate a good powered riding toy just yet. Maybe, but keep in mind little kids between the ages of one and, oh, twelve are basically tiny, subscale drunks. So, with that in mind, I’m proposing two options. The first is what looks like a good, general-funtime ride-on toy, that 6V VW Microbus. It’s only $149, so if you find he’s just not quite old enough to enjoy it yet, you didn’t spend much and you can hold onto it for a year. Also, it’s a Microbus, which is inherently fun, and who’s not going to love a kid tooling around in a VW bus? I mean, look at the kid in the picture there – for some reason he’s dressed like a micro-Professor of Economics at Ithaca College, but he’s still having a blast! Okay, so, for my second idea, I think you should spend $500 and get this astounding golf cart. Look at the nose on that thing! It’s like every ‘80s sportscar you ever wanted! So, I’m thinking that you and the family could use this to just get around NYC – a golf cart is a very under-appreciated solution for that – and at the same time, you could let the little guy drive! Sure, you may have to start with him on your lap so you can work the pedals, but once he’s comfortable steering, I bet you could rig up some pedal extending blocks/rods no problem. I think it’s legal to let a kid drive one of these, especially if I don’t look into it. This way, kid gets a fun electric ride-on, and the family gets a practical electric city-car! All for $500. As Matt mentioned, they make a Power Wheels Porsche 911 GT3, and Toys-R-Us has it on sale for $299. It’s supposed to be modeled after the 991 GT3, but has the side graphics most associated with the 997.2 GT3 RS. I’m okay with this, because it looks good and comes in the greatest Porsche color of all time: Guards Red. This is clearly the correct car that you should buy, and that I should also buy, too. Your wife may like the Cobra, and that’s cool and all, but this sucker’s powered by a 12V right out of the box. You kid could be doing donuts around Cobra Kid in none other than a bright red Porsche. Better yet, it has two seats, paddle shifters (just like the GT3 Cup! ), simulated car sounds (just like a BMW M5! ), and a radio. Blast your friends with the chicken dance like a boss, little man. The Power Wheels modding community is healthy and robust, should you be so inclined. Cool dads everywhere are already stuffing 24V and 36V systems into these 911s. Your humble Porsche two-seater could grow with your child’s insatiable need for more speed. Look, I’ve been thinking about buying this exact car as an overpowered LeMons team ride-on for paddock stuntin’. I don’t even have kids and I’m considering making a crazy impulse buy right after I finish this paragraph. That’s how cool this little car is.